This post was originally published on my now defunct blog Past, Present & Me ON MONDAY, MAY 1, 2006 and has been edited for this blog. When you have experienced the best, anything less is simply not acceptable. When you have grown up eating some of the best mangoes in the world, you just can’t adjust to any other. That’s the problem every Indian has in the US. We have been bred on the famous Alphonso Mangoes all our life and suddenly, we find ourselves in a place where we, for the life of us, can’t find it. We will make all the other adjustments, you see. We will replace our full-fat buffalo milk, that we grew up on, with 2%. We will melt unsalted butter and pretend that it is asli desi ghee. Heck, we will even pretend that tofu is a vegetable. Eventually, we will get used to all of that and stop craving for the original. One thing we will never be able to replace or stop missing is the indian mango. Oh, you can go to the indian store now and pick up good mangoes. They are really good, especially when you compare it to the atrocities that we get at local grocery stores. But they are not the real thing. So, how do you know if its the real thing? Well, for one, if you have eaten mangoes and don’t see what the big deal is, you have not eaten the real thing. 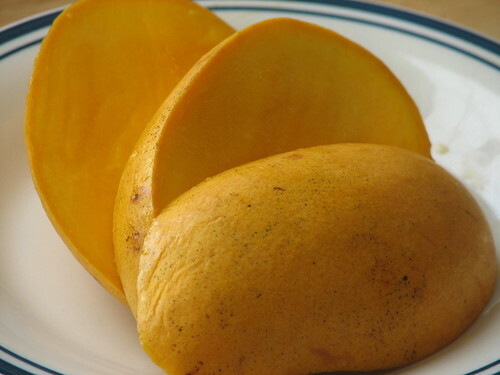 One bite of a real alphonso mango or aapoos aamba as it is called in Bombay, you will know why it is called the king of fruits. The thought that our kids would grow up not knowing its taste was simply untolerable. Of course, things are changing. All things remaining the same, we might have the real thing in US markets next season. Fingers Crossed and all that. I have always associated mangoes with summer vacations. School’s out and suddenly, everything’s about mangoes. Summer vacations coincided with the mango season. There would be a boxes of mangoes in the house, in various stages of ripening. The ripe ones , you eat. The overripe one got converted into various mango flavored eats. There’s Mango lassi, Mango Shakes, Mango Ice creams, Aamras, Mango Burfi etc. etc. The ones that weren’t ripe yet, would be kept in a corner on a pile of dry hay( to help with the ripening process). Then, there were the raw mangoes that would be pickled, or turned into chutneys or concentrated into drinks. I remember snacking on finely chopped raw mango seasoned with chilli powder and salt. Simply marvellous. And, of course, eating the fruit as is. Peel the skin, bite into the juicy flesh with all that juice dripping down your arm as you eat. There was also the aftermath of stains that would be left behind. See, Mangoes tend to be juicy and contain so much pigment, they will permanently stain your clothes. Yep, there were always a few clothes every year that would go the mango way and have to be bleached a mango orange/Yellow. Ahhhh..memories. Melt the butter in the microwave. Pulverise the graham crackers in a food processor until finely crushed. Add the butter and the sugar and process till it mixes together.If you don’t have a food processor, put the graham crackers into a ziploc bag and roll the rolling pin over them until finely crushed. Remove to a bowl. Add the butter and sugar and stir till it all blends together. Take a 9 inch pie plate and press the mixture into the bottom and the sides. Use the cup measure to press it into an even layer. Bake the pie crust in a 350 degrees F Oven for 8 to 10 minutes. Cool. Alternatively, you can use a ready made pre-baked 9 inch graham cracker pie crusts available at most grocery stores. I confess to doing so whenever I am short of time. Whip the Heavy Cream till it forms peaks. You can use the ready made frozen whipped cream. Find the one that is not sweetened. Whisk the cream cheese till smooth. Add the mango pulp and mix well. I use canned mango pulp when I don’t get fresh ones in the market. However, the fresh ones just taste better. Boil the milk on the stovetop or in the microwave. Add the honey and the gelatin and stir till the gelatin melts. This will take some time, about 2-3 minutes.Add this to the cream cheese and mango mixture and stir till everything gets incorporated. Fold the whipped cream into the mixture gently. Pour the mixture into the pie crust and refrigerate for about 6 hours. 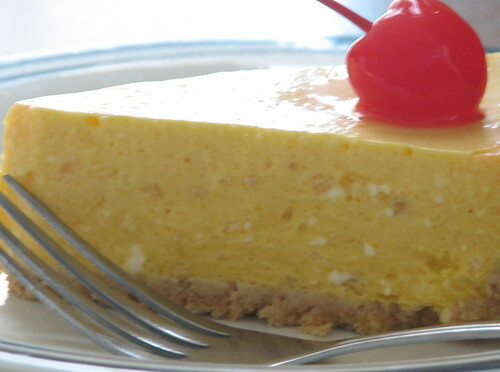 Top with freshly chopped Mangoes or cherries. This is my entry for JFI-Mango Event.